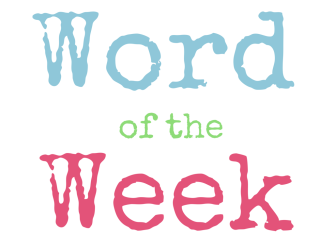 Word of the Week (WOW) is a weekly challenge created by Heena Rathore P. It’s a fun way to improve vocabulary by learning new words every week. To participate, simply do a post with your word and leave the link as a comment on Heena’s WOW post for this week (above link). It’s a nice post to do and will give you some practice with a dictionary, of which there are several online. Illustrations are by not necessary, but it’s up to you. Adjective: Popinjay (when used to describe colours, e.g. popinjay blue; popinjay green). 1. A conceited, vain, foppish, or excessively talkative person. 2. British Dialect. 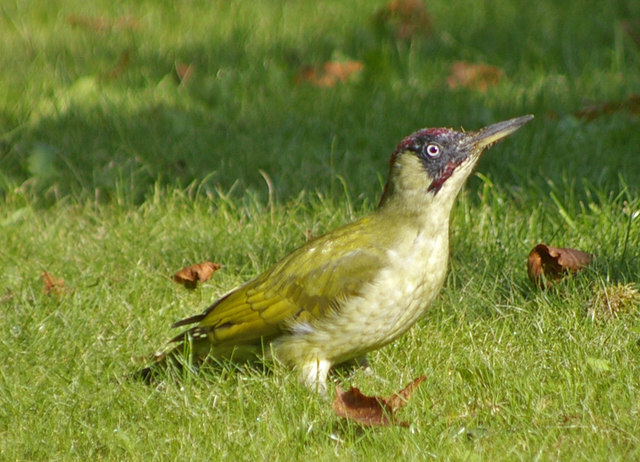 a woodpecker, especially the green woodpecker. Green Woodpecker. Wikimedia Commons. Source: geograph.org.uk. 3. An archaic word for parrot. 4. 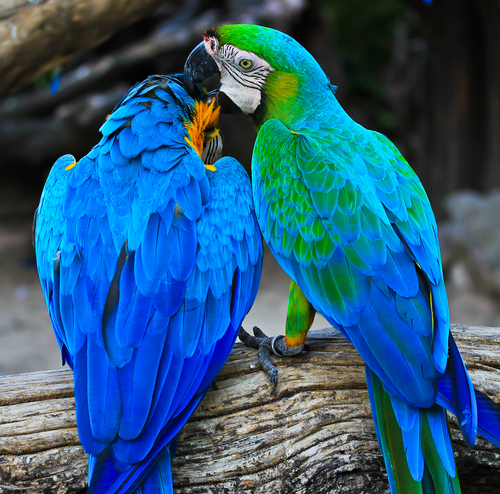 Archaic: the figure of a parrot usually fixed on a pole and used as a target in archery and gun shooting. 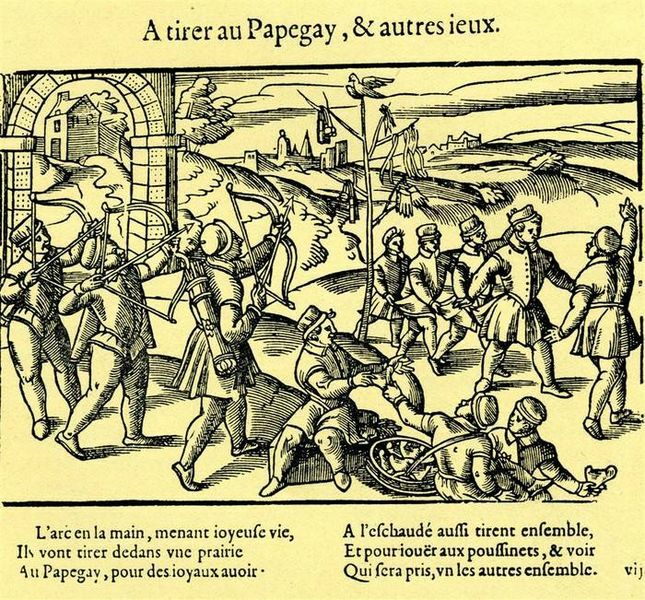 Two men shooting a popinjay (papegai). Public Domain. Anonymous. 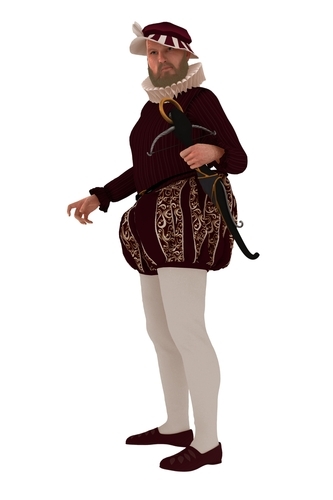 A popinjay is a person who is both talkative and cocky, who struts around chattering like a parrot. 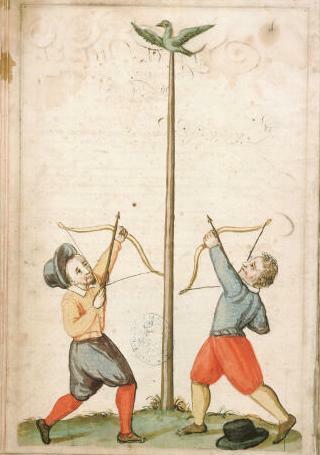 Fittingly, it’s also an old-fashioned word meaning parrot, and the name of a sport also known as pole archery, in which players shoot at wooden bird shapes with either rifles or crossbows. The origin of popinjay is unknown, but one guess is that its roots are imitative, meant to sound like the cry of a bird. fop, swell, buck, peacock, dandy, jackanapes, coxcomb, egoist, egotist, beau, blade, clothes-horse, dude, macaroni, Beau Brummel, blabbermouth, chatterbox. 1. 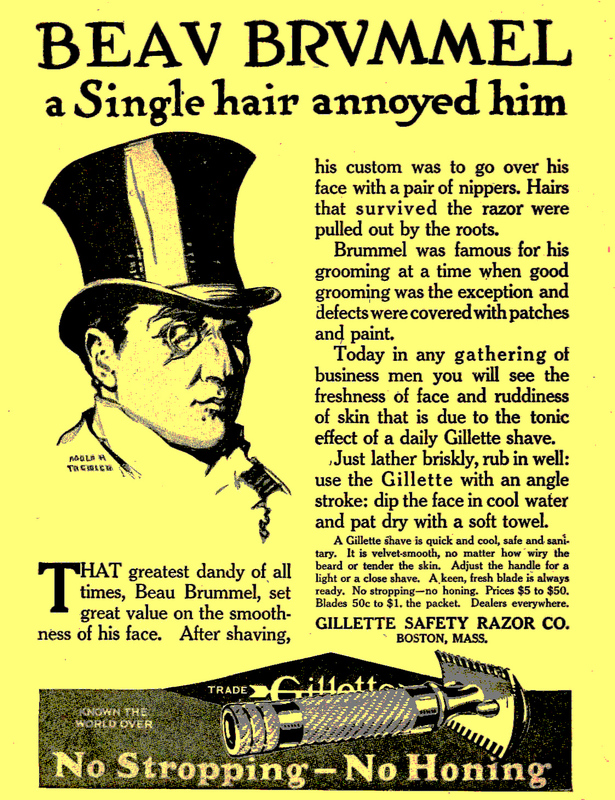 The party host was a strutting, supercilious dandy; a real popinjay. 2. Maria sighed when she realised that her blind date was another Beau Brummel, who cared too much about his own appearance to appreciate the efforts she had made with hers. 3. The men congregated around the pole, some taking aim at the wooden popinjay fixed securely to the top. 4. (Adjective use). Carol’s new dress was a bright, popinjay blue. I love this and although I do not have time to participate I will look forward to your submissions. I know how many challenges you already do, Dawn, and I really admire how you manage to fit them all in. 🙂 Thank you very much for liking my posts, though. 🙂 I love finding things out about words – as I’m sure you do. Finding nice pics to illustrate them can be a bit tricky sometimes, and I’ve abandoned some really good words because I couldn’t find suitable illustrations. But it was my own choice to illustrate, and Louise decided to as well (my daughter – afairymind). I love all the stuff you added to this. From the different meanings to the sound clip. Very well done. Thanks again, Dawn! I really enjoy doing this challenge. It’s a bit different to flash fiction. But it is so important, I think. Expanding ones vocabulary is always a good idea, more so if you write. The teacher in you comes to the fore Millie, great post, I learned something new today….I may have a try at this one…. Love this one Millie. So many different uses. A lovely old word that I enjoyed learning about. Take your time, We learn and then we can’t live without, lol. Naaaa, just kidding 😀 Take things slow and I am sure you will learn about all these social media, lol. 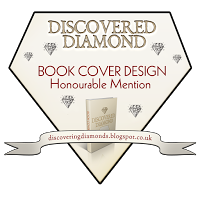 Tweet a bit about your book and a bit about your posts. The rest tweet about something you read, seen, heard, quotes, pictures, something you did. Anything that you think “this is okay to share with others”, lol. And… from time to time articles you liked and pictures. What I love about the social media that you don’t need to self promote much, but to be yourself and be active. If you just write about your writing it will not work. Even I hate that and block them, lol. I don’t want to see my feed full of only books people wrote and nothing else, lol. I am happy to help if I can. A most excellent WOW, Millie! What a wonderful word! New to me. I too love the idea of using it for a blue or green colour – or a mixture of blue/green colours. Thanks for introducing me to it. Glad you liked this one, Bekki. I think it’s quite a pretty sound – especially for describing those colours. And for describing a parrot, of course! Yes, definitely an attractive word. Reminded me of Mockingjay too – which I guess has the same route and popinjay literally meaning birds that make popping noises? Yes, it sounds exactly the same route. If you’ve read any Dorothy Dunnet’d novels about Lymond, set in the 26th century, she refers to the parrot on the pole as a papingo. I wondered whether that was the Scottish version. In that particular scene, the target is actually a real parrot, not a wooden one. I’ve not read her work, but yes, sounds very likely.